Snifty Scented Pens are available in four delicious scents with corresponding artwork. Imagine yummy vanilla cupcakes, a sweet strawberries, juicy watermelons and sticky sweet Bubblegum at your fingertips anytime of the day. Snifty Pens are created using a non-toxic scented molded plastic — this keeps their scent long-lasting. 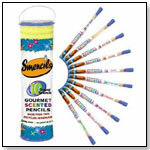 The delicious aroma of SNIFTY pens will make you feel nifty! $1.95 per pen. Available to retailers in a box of 50. Designed for 5- to 10-year-olds, the Fleurville messenger comes in three colors. It has backpack straps and includes a removable, insulated lunch bag. The bag is PVC-free, Teflon-free and lead-free. "The Kid's Messenger bag is extremely stylish and functional, which is hard to find," Analese Belle, in marketing and PR for Fleurville and parent company JJ Cole, told TDmonthly. Launch date: December 2009. Tomiko Japanese Erasers feature colorful and fun erasers in the shape of items such as ice cream, cakes, pizza, etc. Over 90 different styles available. This package includes 20 elephant-shaped paper clips in assorted colors. Winner of industry awards, this teacher's edition of the Spoils of Civilization is a math set for the classroom designed to motivate students to complete class and home work and improve class attendance and behavior through workbooks and class materials. Also includes a fun story about the Merbs™. Crazyoleez blend various colors of crayon into a single decorative shape, for a distinctive artistic experience while coloring. Other shapes and sizes are available. From: THE PENCIL GRIP INC.
Other products from THE PENCIL GRIP INC. The JUMBO Grip features the same shape as The Pencil Grip to place fingers in the correct stance for gripping, for both right- and left-handed writers. 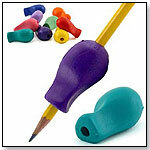 It’s about 40-percent bigger than The Pencil Grip, designed to offer comfort and support up to the second knuckle. — Joan Machlis, owner of Wind Up Here in Olympia, Wash., told TDmonthly in fall 2009 that the store sells about 50 items per month by the Pencil Grip. — ''We sell maybe 75 per month,'' Mike DiAndrea, manager of Hardware Centre, Inc., in Paoli, Pa., told TDmonthly. This 24-pack of colorful silicone bands features dogs, cats, ducks, turtles, rabbits and pigs that are die molded. They can be treated as traditional rubber bands and worn as bracelets but spring back into their original pet shape when not in use. 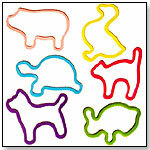 — TDmonthly first reported on the popularity of Animal Rubber Bands in 2005. That product was designed by Yumiko Ohashi and Masonar Haneda of Passkey Design and distributed in the U.S. by Eastern Accent International. Toysmith also has a very similar product that debuted at Toy Fair 2009. — Marie Yakes, owner of the Papillon, Neb., Sweet & Sassy party and spa shop told TDmonthly in mid-November 2009 that she was eagerly awaiting her first shipment of rubber band animals, scheduled to arrive the next day. She said one of the other franchise owners was "doing $3,000 a weekend in those silly Silly Bandz. And she gets calls about them!" Yakes said the bands have been banned in Tennessee schools, so she's hoping to get some good press out of their Nebraska debut. 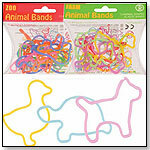 — Animal rubber band bracelets were listed as a top-10 best seller online by Owner David Davis of RoundTable Toys in Winterville, N.C., in January 2010. Risas y Sonrisas (which is Spanish for "Laughter and Smiles") is a Spanish Program for kids that makes teaching and learning Spanish enjoyable. The Student Book includes an interactive CD-ROM and a Skits DVD. The interactive CD-ROM is the voice of the book. It is divided into five areas: Pronunciation, Songs, Vocabulary, Q&A, and Verb Conjugations. The Skits DVD incorporates vocabulary and Q&A learned in each chapter with subtitles to read and repeat whenever necessary. Vocabulary Units are illustrated in the same order as the Songs. They have Q&A of high frequency to use in conversations, a skit and a cultural point at the end of each chapter. This audiovisual presentation helps young and older students learn at their own pace. Everything learned with the classroom program is included in the student book to practice at home. This product was named one of Dr. Toy's 100 Best Children's Products 2009. The Teamson Design Windsor Collection table and chair is a high-quality and safe table/chair set with ample shelf space below the tabletop that the children can use for storage. "Large shelf space below the table top makes it easy to store items. [The] large, wide table top makes it a perfect surface for the child to work on. High quality, solid wood table/chair legs are very strong and resist breakage," Jerry Su, president of Teamson Design Corp., told TDmonthly. Launch date: June 2009. Set of 5 Holiday Smencils featuring Gingerbread, Sugar Plum, Candy Cane, Cinnamon and Sugar Cookie flavors. Holiday Smencils are seasonal. International Arrivals will begin shipping September 2010. Scented pens available in Gingerbread or Candy Cane flavors. Holiday Snifty Scented Pens are seasonal. International Arrivals will begin shipping September 2010. 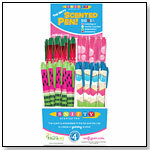 — Assorted Snifty pens have been best sellers at The Parent-Teacher Store & Toys Too in Louisville, Ky., for about four months, Owner Kimberly Kopatz told TDmonthly in November 2009. 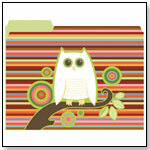 This set of 6 printed file folders features an artful design of an owl over a color stripe background on the folder cover. Set includes folders with 3 tab locations and includes 12 Adhesive Tab Labels. These colorful rubber bands function like traditional bands but feature fun animal shapes when not holding something together. — "We got 270 packages on Thursday and were sold out by Saturday morning. High school, middle school and elementary school kids are all buying them," Katie Rook, owner of Be Beep A Toy Shop in Columbia, S.C., told TDmonthly in fall 2009. — Editors Note: This item is very similar to the Animal Rubber Bands by Eastern Accent Int'l, first reported by TDmonthly in 2005. Other products from WONIL INDUSTRIAL CO. Designed for quick, simple cutting of small tapes, this dispenser cuts large quantities of tape to a 3.8-cm length with a single rotation of the handle. It may also be used as storage for pens, scissors or name cards. The product is available in pink, light blue and yellow. Launch date: 2008. Designed for quick, simple cutting of Scotch-type tapes, this dispenser cuts large quantities of tape to a 3.8-cm length with a single rotation of the handle. It may also be used as storage for pens, scissors or name cards. The product is available in pink, light blue and yellow. Launch date: 2002. This bookmark features a colorful palette of the world under the sea, with an eye-catching three-dimensional effect. — Gary Green of Toy Box of Asheville in North Carolina told TDmonthly in summer 2009 that his store sells 60 to 70 of these bookmarks per month. “It seems to me we do a reorder once a month with them. It's not something people come to the store for, but it's so eye-catching that it stands out,” he said. These small cupcake erasers with removable parts are available as a trio and in single packs. — Three of 38 specialty retailers named Iwako erasers as a best-selling novelty item in late summer 2009. 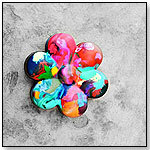 Going into the holiday season 2009 (late fall), two of 44 retailers named the erasers among their absolute best sellers. 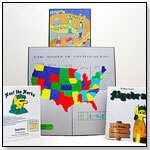 From: ROCK 'N LEARN INC.
Other products from ROCK 'N LEARN INC. Kids can explore the systems of the human body — skeletal, nervous, muscular, circulatory, urinary, respiratory and digestive systems — in this 52-minute DVD that meets National Science Education Standards. Created for grades 4 through 8, it also covers the five senses and offers a bonus segment on healthy nutrition, exercise and MyPyramid. Launch date: October 2009. Led by D.J. Doc Roc, positive lyrics, cool rap music and high-energy action characterize this educational DVD. Sums up to 18 and differences from 18 are covered in these "add and subtract songs." This product was named one of Dr. Toy's 100 Best Children's Products 2009. Launch date: August 25, 2009. The Toy Story pens come in three styles: Woody, Buzz Lightyear and Little Green Men. "Toy Story Talking Pens will be launching just in time for the re-release of 'Toy Story' 1 & 2 and the release of 'Toy Story 3' in 2010. Launch date: December 2009. Each display of these talking bookmarks comes with 24 bookmarks — six of each style: dog, cat, horse and monkey. Users simply press the bookmark to hear the respective animal sound. Launch date: 2009. Fred Figglehorn, the first YouTube star to land 1 million subscribers, is the focus of this talking pen that says five of Fred’s most famous lines. "Fred is the hottest licensed property of 2009," Kristin Baker, in sales admin at Kamhi World, told TDmonthly. Launch date: 2009. With the USB Interface Kit, robot lovers can connect the Robotic Arm Edge to a PC and have real-time manual control of the robotic arm and program the arm to perform a sequence of movements — just like an actual robot on an assembly line. The kit comes complete with a CD, a printed circuit board, a USB cable and accessories, and a detailed instruction manual. Launch date: April 2009.